How Important Is Bore Lapping? Bore lapping is an old technique that is used to help make bore cleaning easier, make it less likely to foul, and to improve overall accuracy. Bores can be uneven and rough in the inside of the cylinder, even fresh from the factory. Bore lapping is a way of breaking in the barrel to get it ready for shooting. Bore lapping has become increasingly popular the past few years, but it is an old practice that has been used for centuries. Although hand-lapping is the traditional method of lapping, the easiest, fastest way to bore lap is to fire lap the barrel. To hand lap a bore, using a molten lead lap produced to fit the bore, you must cover it with an abrasive compound and work the lap back and forth to lap the barrel. This method can work, but it may take some time before you begin to notice any improvement in the barrel. For a less labor-intensive method, fire lapping is the more popular choice. Fire lapping can produce dramatic results with minimum effort. Fire lapping is done by shooting a series of bullets coated in an abrasive compound through the bore with a series of different grits to slowly smooth the inside of the barrel. As a reference, we’ll be using the Wheeler bore lapping kit. Most fire lapping kits will come with an abrasive compound and two application plates for applying the compound to your bullets. The Wheeler kit comes with three different types of grits for lapping, 220, 320, and 600, designed to move up in grit after each round of firing. It is important to be sure to clean your bore after switching between firing the different grit levels. 220 grit is not suggested for high-quality factory barrels. It is also important to note that fire lapping is designed to be taken in small steps, as fire lapping only removes small bits of steel at a time; performing this process hastily could possibly damage your barrel through scratching. The first thing you want to do is to thoroughly clean your bore. Start with the lowest number of your abrasive compound (in this case, 220 grit) and rub it on one of your application plates. You don’t need too much of the compound. 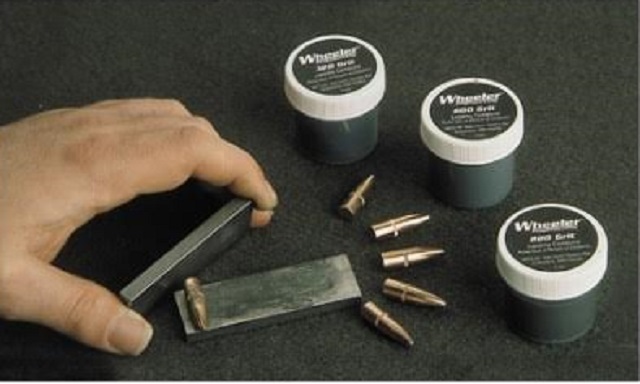 Steadily roll the bullet across the lapping compound using the other application plate on top, which coats the bullet in the grit. Repeat this step five to six times. Wipe off any excess compound when you’re finished to avoid any clumps. If you have correctly coated your bullets, a grayish ring will appear on the bearing surface. This shows that the compound has been thoroughly embedded in your bullets. As the bullet travels through the bore, the coated bearing surface is what laps the inside of your barrel by dragging the grit through at a high velocity. For this particular lapping kit, it’s recommended to do five shots of the 220 grit, five shots of the 320 grit, and ten shots of the 600 grit. You can switch the number of shots around between the grits, but it is .not suggested to do more than twenty shots total. Let SAFEGO Save Your Summer!